﻿ HuntingNut » Forums » Hunting » Big Game Hunting » My wife's first moose. 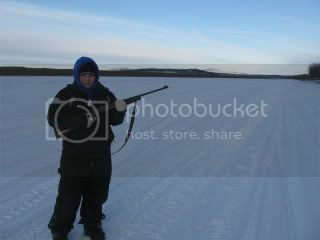 Posted: Sun Dec 13, 2009 9:38 am Post subject: My wife's first moose. Here is a photo of my wife's first moose. She used my 270 Winchester, 130 grain Remington Core-Lokt bullets that were loaded just above medium charge. Posted: Sun Dec 13, 2009 11:33 am Post subject: Re: My wife's first moose. Posted: Sun Dec 13, 2009 12:36 pm Post subject: Re: My wife's first moose. Posted: Sun Dec 13, 2009 1:55 pm Post subject: Re: My wife's first moose. Hopefully the first of many to come......congrats to her !!! Posted: Sun Dec 13, 2009 3:49 pm Post subject: Re: My wife's first moose. Posted: Mon Dec 14, 2009 12:23 am Post subject: Re: My wife's first moose. Moose, on my wish list. Posted: Mon Dec 14, 2009 10:21 am Post subject: Re: My wife's first moose. Thanks guys. She is hooked for life on hunting now...she even got herself a new rifle... a BLR 7mm-08. Wish I could get myself a 'new gun'...oh well its all good. Posted: Mon Dec 14, 2009 10:46 am Post subject: Re: My wife's first moose. Posted: Mon Dec 14, 2009 3:20 pm Post subject: Re: My wife's first moose. OMG!!! YES!! Way to go!! 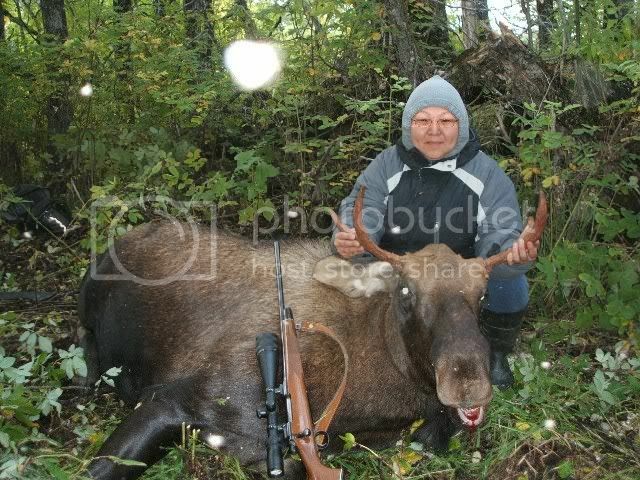 Posted: Tue Dec 15, 2009 5:59 pm Post subject: Re: My wife's first moose. Posted: Tue Dec 15, 2009 10:18 pm Post subject: Re: My wife's first moose. Posted: Tue Dec 29, 2009 7:20 pm Post subject: Re: My wife's first moose. Nice Moose, looks like she had a great hunt. Posted: Thu Mar 04, 2010 11:11 pm Post subject: Re: My wife's first moose. My 14 year old daughter is following in her mother's footsteps and using her blr 7mm-08. We seen some moose during the winter moose season, but my daughter didn't feel comfortable shooting at longer ranges beyond 150 yards. Here she is holding her mother's rifle. Posted: Fri Mar 05, 2010 12:06 am Post subject: Re: My wife's first moose. That is terrific that she wants to hunt with you! I keep hoping mine might decide to go with me some.